AMAZING!! We went up to Pepperell, 4 of us and we had an amazing time. The staff could not have been friendlier. We jumped tandem with Eric, Keith, Vinny and Ian and all 4 couldn't have been nicer and incredibly fun, it was clear they loved their jobs. Russell on the ground was awesome helping us get harnessed and calming our nerves. I jumped with Eric and O WOW did he take some amazing handcam pictures! I am completely in love with my pictures and video! My sister's video and pictures had a few smudges, were a bit blurry but she still got some great shots, and was too psyched about how awesome Ian made her jump to care. I am sure there are other places with great staff and maybe better views and higher jumps but we all absolutely loved the experience at Pepperell! Another 5 Star experience after many years of wanting to return. Vinnie was my guy.... bwahahah we had a blast! Stop saying "I'll do someday," get a Groupon, and JUST DO IT. Totally fantastic; I wouldn't have changed a thing (except for the humiliating scream I let out for wayyyyy too long on the way down). - We were put on a wind delay, which was a bummer, but we were presented with lots of options for when to jump at no additional cost - including even next year, if need be. - The legal waivers and things are painful and stressful, sure, but they have to be. Look at them as an opportunity to get amped. They are over with as quickly as possible. Also there's an outtake reel at the end of the film that's worth checking out! - I had Iain Guthrie as my instructor and Dmitri ___ as my videographer. They were great. I made it clear from the beginning that I was quite anxious and that my usual sense of humor wasn't with me at that moment, and they did not mess with me at all. They reassured me, Iain coached me and answered all of my questions, and was very patient with me during what I'm sure was a boring ride for him! - Dmitri got great footage and kept the excitement level up. - The flashdrives with our videos and lots of pictures for each of us were ready about 20 minutes after we landed, which was great because we got to relive it all right away. I chose this place because a professional skydiver friend of mine recommended it as the best in the area, and she was right! Excellent experience for me and my 22 year-old daughter. Both first time skydivers. The best advice I read before going: Arrive early and watch the rhythm and flow of the scene. Planes go up full of skydivers, all of the divers come down to the ground safe & sound with big smiles on their faces. Our dive was delayed due to bad weather in the morning, so we saw at least 5 plane-loads of people do this. By the time it was our turn, we were eager, not nervous. We purchased one full video package & one handcam package and that was the right choice; best of both worlds. The handcam video is longer because it tapes the entire skydive all the way down. 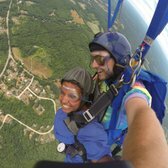 The video package has a separate photographer capturing your freefall, but then s/he races down to get your landing on camera. 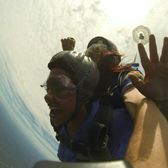 My "buddy" was free to do spins and a fun half-flip/roll out of the plane because he didn't have a camera on his hand. Riccardo & Rick were excellent. The place works like clockwork! Site and its Contents, Copyright © 2019 Pepperell Skydiving Center. All Rights Reserved.